Since we’re on the subject of water as of my last post, I want to share with you my own water wisdom. I find that plain water with nothing in it is the best for hydrating the body. Once you add a slice of lemon, or any other thing to the water, it becomes something for your body to digest in a different way than how it handles plain water. It’s my opinion that plain water requires little work for the body to take in compared to other liquids, teas, infusions or beverages. That said, I want to give you a recipe that I suppose is technically a tea. It is another mix of water and vegetables and it definitely has an effect on your body. This is a beverage that helps you satisfy a craving for sugar and sweets by providing the naturally sweet taste of vegetables. This is really great for anyone who is trying to get off a sugar habit. Sweet vegetable tea is not my own creation. It is something I learned from studying macrobiotic cooking and I’m using it quite a bit right now to assist my husband and myself with sweet cravings we’re having. You’ll be amazed how sweet, delicious and satisfying this is. You can drink some of it whenever you are craving sweets and you’ll get the natural sweetness of vegetables! 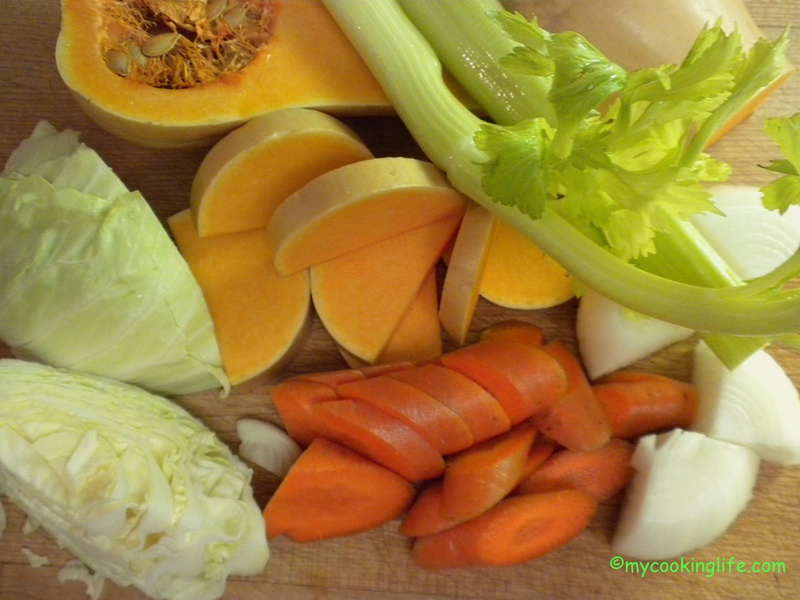 This is what I used the other day to make Sweet Vegetable Tea: half a small head of cabbage, several thick slices of butternut squash, two stalks of celery, an onion, and a large carrot. Just a pinch of sea salt—no other flavoring. All of it was simmered in about 2 quarts of water and simmered for about an hour yielding a quart of the tea. You can use other sweet veggies such as parsnips, cauliflower, the stems from collards or broccoli or whatever you like. I’m doing this tomorrow. I don’t eat much when hub’s out to sea, and this sounds delicious. It is delicious and so easy! I would love to hear how yours turns out! Interesting. Never thought of drinking something like this. I have been a *tad* addicted to teas and, OK, sometimes coffees. Have now cut off the coffee and have really cut down on the caff teas. Just drinking one cup of white/green tea a day now. Thank you for writing this. Hi Kathy! This sweet veg tea is very popular at our house! Interesting you mention cutting back on tea and now no coffee. I’ve recently realized that the days of my heavy reliance on caffeine were mostly also the times I ate quite a bit of animal food especially meat. I too have cut back to one green tea a day and I’m perfectly happy with only that! I do also drink “Bancha Tea” which is roasted tea stems and twigs – naturally non-caffeinated and very alkalizing.